A replica Vietnam Wall in Los Angeles was defaced by vandals, but the larger monument in Washington, D.C., was not. The Vietnam Veterans Memorial was defaced with graffiti. 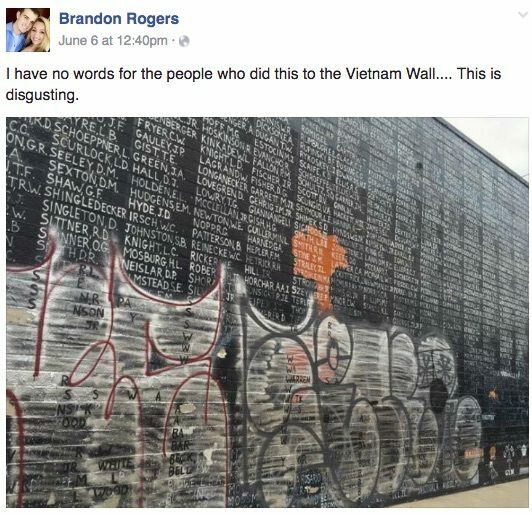 A replica Vietnam wall in Los Angeles was defaced with graffiti in late May 2016. The larger Vietnam Veterans Memorial Wall was not defaced. The wall has been tagged previously but the latest vandalism covers the bottom half of the memorial for much of its length. Officials said that the damage from a graffiti attack on a veterans memorial in Venice was so extensive that it will take some time to restore the monument. Volunteers removed much of the graffiti over the Memorial Day weekend but it appears more work will be necessary to fully restore the memorial. The memorial is painted on the side of a Metro building. Residents expressed outrage over the vandalism. The replica Vietnam Wall in Los Angeles was painted by a veteran and dedicated in 1992. Restoration efforts (much of it performed by volunteer veterans) were undertaken immediately after the defacement, but local officials described the damage as extensive, and in the interim the wall was covered as a gesture of respect to the fallen. Los Angeles Times. 30 May 2016.